This week I would like your valued opinion on an idea I have. For the last few months I have been working on an exclusive range of designs for Country Bumpkin Publications in Australia – there are 2 birds and 2 vintage flowers in the range. I have completed the 2 birds, one, the Red Rumped Parrot is now available in kit form from Country Bumpkins and the other Forest Kingfisher is being packed up ready to send this week. 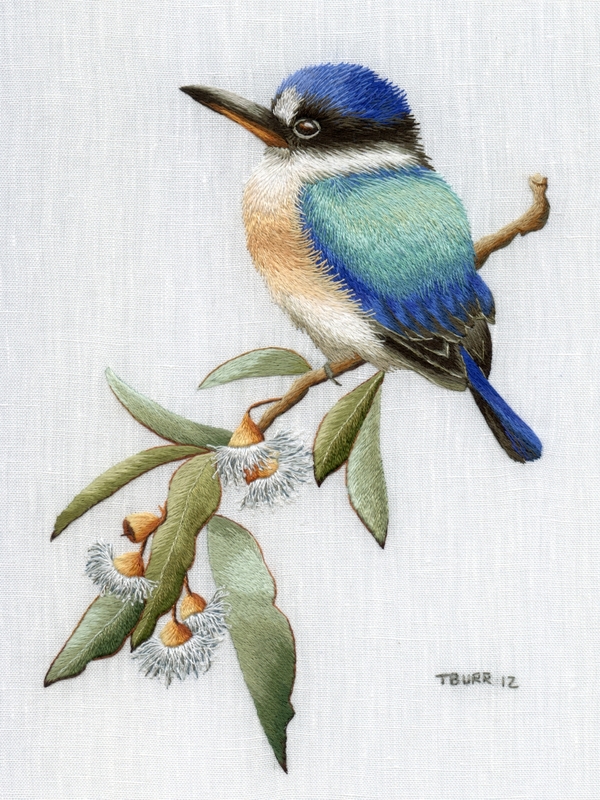 These bird designs are larger than normal and aimed at the more experienced stitcher – the designs are only available from Country Bumpkins see here. The next two designs are based on Vintage flowers the first, Victorian Pansies is complete and I am in the process of stitching the second which you will have to wait to see! 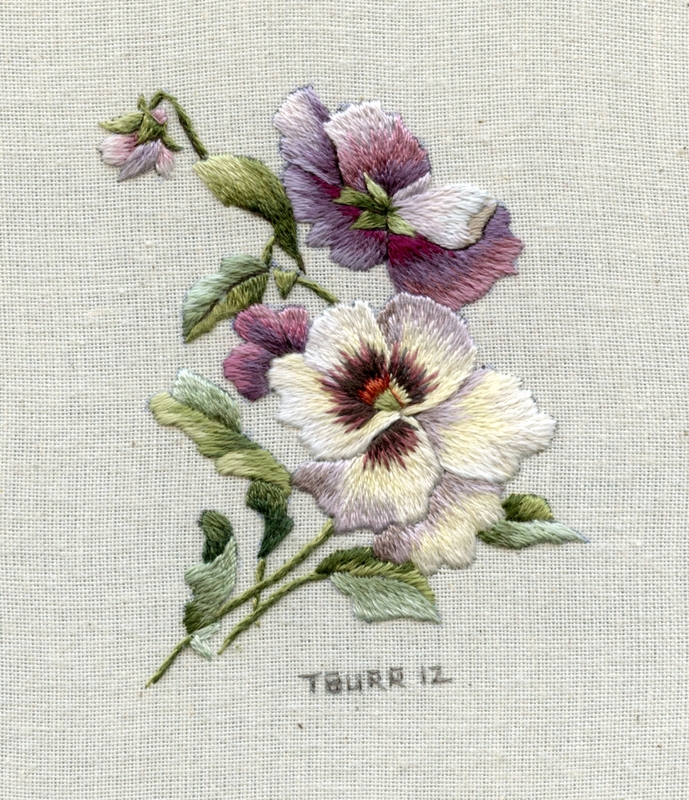 These flower designs are aimed at the intermediate stitcher and are medium size. 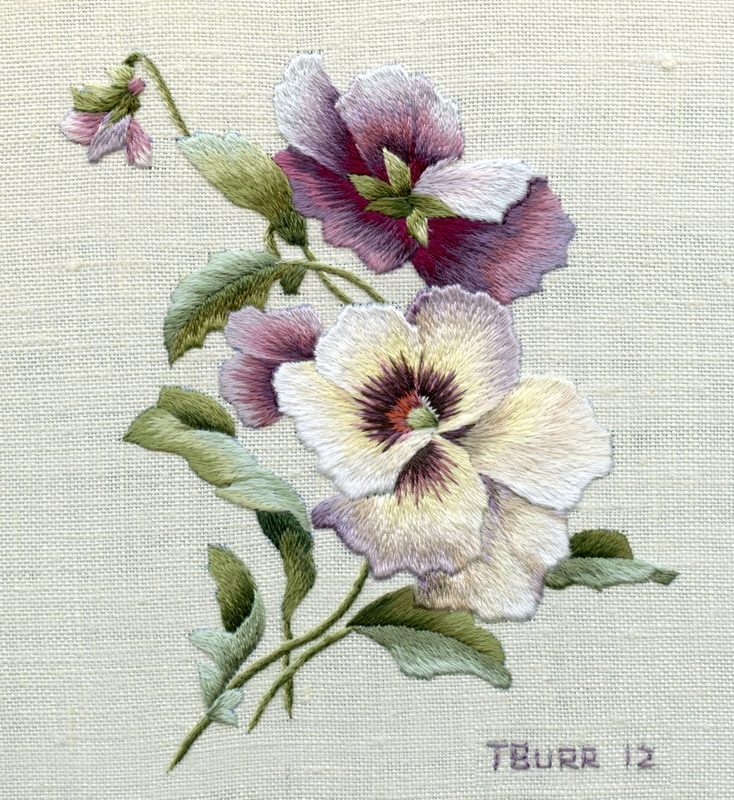 I really enjoyed stitching the Victorian Pansies – the design was reproduced from an antique Victorian postcard, I love the way that the Victorian’s illustrated with a slight frilly flourish to everything and of course those gorgeous creamy, muted shades are to die for! Having completed the design I decided to try something I have been wanting to do for a very long time and that is MINIATURE EMBROIDERY. So I re-stitched the same design in miniature, this was the result. The stitching is approx 5 x 6cm (2,5 x 2,5 inches). It took some adjusting of the colours to fit into a smaller space but the stitching was no more difficult to do than a larger piece and all the detail is there just in minute form. 1. What do you think about a miniature range of kits – I am thinking Vintage flowers, birds etc. 2. I wanted to re-create the antique vintage background and found the best fabric to use was a calico, but of course it would have to be a very good quality calico (muslin in the US) with a high thread count which I am still trying to source through my suppliers. The second option would be to use the milky background of my cotton satin which is good quality and the right weight. What are your thoughts on the background fabric, which one do you think would be right? Working backwards through your blog after a blog break – the idea of using vintage postcards as inspiration is wonderful….I have several I grabbed from Ebay and odd places (or been sent) on my walls here. I agree about the colours! Red rumped parrot – the radio was talking about Red Rump P’s in Tasmania the other day…..the same bird?!?! 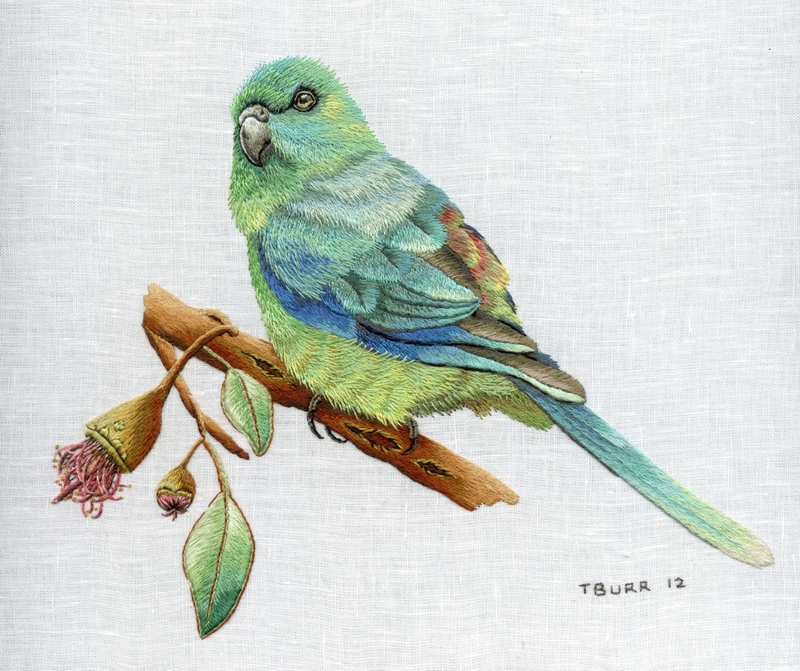 How could you *not* notice and remember a name like “Red Rumped” Parrot if you happen to be listening to a Twitcher segment on the radio…..
New follower here after purchasing Colour Confidence in Embroidery! Just superb work and I love all the designs! The red-rumped parrot is a regular visitor in my garden; also have the Sacred Kingfisher (not the Forest K), and pansies are one of my favourite flowers, so I’d love to try the miniatures – eventually! Have to begin on beginner’s projects first though. Your embroidery is just breathtaking Trish. Hi Trish – i would definitely enjoy embroidering the miniatures – it is a lovely idea. As far as material preference is concerned, I would go for the cotton satin. I think that this is a wonderful idea. You get satisfaction of a finished piece, much more quickly. Don’t forget to make some that are in beginner level. My name is Victoria and I am Deaf. I’ve done embroidery and crochet since I was 9 years old. My husband of 37 years is on Hospice now and I’ve been looking for something new and inspiring to fill the void in my heart. I’ve chosen your Victorian pansies to embroider. I love everything Victorian. Thank you for adding to my life with your beautiful design. Hi Trush, I believe cotton satin would be best, what about ironing a pure cotton intterfacing with a glue binder at the back to stabilise the fabric. This works well with cross stitch to make the work look finer and also to stop stretch in the fabric. Makes the work nice and firm too. I see you say the designs are available through Country Bumpkins. What worries me is that us South Africans would like to benefit from SA designers by not the exhorbitant exchange rates. Who are your stockists for your books, designs etc in South Africa? Hi Theresa My products are all available through my online shop and are available to both South African and Overseas customers alike. I generally don’t sell to the retail trade, however I did agree to make an exception and create a small exclusive range for Country Bumpkin – this is to avoid discrepancy in prices between my products and theirs. If they decide to discontinue these kits they will revert back to me and be available through my shop. I think I speak on behalf of Hazel, Di & myself when I say that we always try to price our products at a reasonable level that is affordable to both overseas and local customers, but please understand that most of the materials included in a kit, i.e. fabric, threads and needles have to be imported into South Africa (as they are not manufactured locally) in order to maintain the quality of our kits. 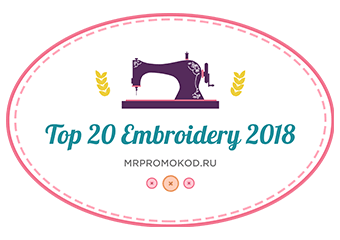 We strive to provide excellence in quality in both the presentation and preparation of our products and I know as a fellow embroiderer that you will appreciate the immense amount of work that goes into them? I will be returning from leave about 3 weeks into Jan, so will contact you for prices then. I think the miniatures are a wonderful idea. Your pansies are beautiful and I can’t wait to stitch them, plus other antique flowers and birds. Yes wall space is always an issue and this way we may stitch more of your beautiful designs. Your cotton satin is a lovely fabric and I am thoroughly enjoying stitching on it with your on – line butterfly kit. If you wanted to age it, you could always tea dye it. Thank you for continuing to provide us with such spectacular designs to stitch. LOVE the miniature idea. It allows me more flexibility to use the design on other pieces I’m working on such as a crazy quilt. For this application, I would prefer calico over satin . Also, any way to electronically buy the pattern and the color selection without needing to purchase the fabric and threads? Hi Trish, those designs are beautiful! I have no clue on the fabrics, but if that’s what you used for the pansies I see no problem. I just love the idea of minitures and was rather hoping you would do some guinea fowl! Your work is outstanding – wish I had your talent! The idea of ‘tea dying’ sounds interesting – especially for the vintage look. First : WOW! I love your designs!! 1- That’s great news, I like so much your idea about miniature designs! Hi Trish, the idea of miniatures is an excellent one. It is easy to find small cross stitch patterns but not so easy to find shaded embroidery ones. These would be great for little needle book covers, or to use as embellishments on other similar projects. I think a really good quilters cotton would be my fabric of choice over muslin. The fabric is smoother and easy to sew through, and also can be tea dyed with great results. The new patterns are beautiful!! I would love to see a range of miniature embroideries based on vintage designs. I love the pansies you have just created – the colours are gorgeous. As always your embroidery is exquisite. Definitely yes to miniatures. Many of us love stitching small pieces – I even love miniature paintings – and they are great for travelling. As for the fabric – I leave that up to your expertise. Please, before, excuse my english written very bad, I am French woman and I learn English at School, your embroidery is very beautiful and elegantly. Amitiés brodées. I don’t know about fabric types… just would have to have something I could get easily in the USA. I really LOVE the birds and I am a BIG fan of parrots since I own two. 🙂 Would love to see a series of miniature colorful bird designs in a book of yours. Miniatures would be quicker to do then a bigger project so I could squeeze them in between my bigger cross stitch endeavors without feeling guilty….LOL! Great job Trish. Your designs are just gorgeous! Hello Trish. The new designs are lovely. Would love miniature designs, especially of birds. Would be very interested to know if you find a good quality muslin (calico) that you like. I think it would be a very different background. Thank-you for all your lovely designs and wonderful books. I’m looking forward to the *miniatures*! I can see a whole book coming. Maybe an *ebook* I am thinking the US is patiently waiting for the Red Cardinal. And it would be lovely set in a vintage style. For the fabric I still favor the cotton satin you carry , it has a lovely hand and the needle glides through so effortlessly. The cotton calico, in the uSA some compare it to muslin. I think rather that the euro calico compares to uSA quilters cotton which comes in many colors and prints also. The muslin available here is of various qualities, from a thin papery type to a thick close sateen. some of which are not pleasant to stitch on because even after pre-washing the needle does not glide through it. I recently saw someone using a cotton with a print that looked like a letter written on textured paper, then she appliqued a bird and branches and added lots of embroidery details. It was lovely. I have stitched your designs on your own cotton satin fabric, lawn backed with calico, quilters cotton, batik cotton, jean, ‘natural fiber’ a cotton with a linen look to it yet uneven weave. I think I would try a miniature on cotton satin that has been tea-died first. Happy stitching! I’m working on the Little Bee Eater. Only he may not eat any of my honey bees! A definite YES to the miniatures. As to fabric – either calico or cotton satin is okay with me. I think it’s a great idea! I only wish I had the talent for doing it. Your work is simply beautiful! Just to clarify. The 2 bird kits and the 2 vintage flower kits (including the Victorian Pansies) are available exclusively through Country Bumpkin Australia. Entirely seperate to these are my own range of kits (including the forthcoming vintage collection and hopefully miniature collection) which can be found on my website and the Etsy shop. Trish, I think the miniatures would be good for those learning because they have fewer stitches and would take less time. Time seems to be a big problem for me these days, but I really want to do more shading and improve my skills. I do think I prefer the look of the regular size, though. I hope you would offer both. I LOVE the pansy piece. Might you publish the designs in another book? I am not familiar with the fabrics so cannot comment on that. Your birds are fantastic. �Especially the parrot. �But my favorite of all so far is your victorian pansies. �They are so beautiful. �I just can’t find the right words, as they are more than beautiful. I am sorry, but I don’t really have any better opinion than you would have on your backgrounds. �I just wish I could purchase your kits. �The shipping cost from Australia plus the cost of your kits are just so out of reach of most of us. Is there any way someone here could assemble your kits and sell them here so that they are more affordable? Is there any way you could design some of our birds and flowers (like the victorian pansies) or write a book about how to design our own? �Or is that just something I need to keep practicing to figure out how to do it? You are just so special. �Thanks for all the beauty you add to the world and thanks for sharing. I have never done minatures in needlework only painted and dressed minature dolls.But that would be a different type of needlework to learn good idea Trish I like the thoughts of the cotton Satin as the background.As yet I have not done one of your pieces even tho I have all of your books your kits are on my wish list. I look for your books and buy them as soon as I can get them here in Canada. Your work is stunning and I love it all of it. Keep it up and have a great day everyone. I have some of your books, but am ashamed to admit I have not started anything as yet. Mainly because I am a bit daunted. I’ve done some of my own designs using your techniques and some of my own that have worked out fairly well, but I would be thrilled to have the opportunity to create a smaller version of your work. I think it is a great idea; especially as we near Christmas. Yes, yes, yes again to miniatures and I think on muslin where the sheen of the silks won’t compete with the background fabric. It is nice to have smaller pieces to work on…I think it is a great idea.. Your work is stunning. It’s so delicate and subtle. I just had to stare at them with my mouth hanging open. lol I love the miniatures! 1. I personally do not do kits, but would certainly recommend one of those for someone who likes them. Trish, I loved working on your cotton sateen so that would be my choice. The closest fabric store to me doesn’t carry a muslin with a close enough weave and to order the fabric is quesionable. It seems never heavy enough or high enough count. I never thought of high count sheeting…that might work. Thanks, the cotton satin is much easier for me to obtain but unfortunately does not come in any other colour but milky white so I thought the calico with its slight imperfections might be good for the vintage range. However, I will test out both for washing and wear, and carefully weight up the options before making a decision. Trish. It is really hard to stitch on high count sheeting. Found it out when I used it in a quilt and had a lot of trouble even tying it and forget quilting! I love the idea of miniatures and hope that you will continue. Here in my part of the world (USA Georgia) after receiving your first pansy kit to learn how to do your technique, I found a wonderful 200 count cotton that made a beautiful pansy, purchased your book and have continued to use that cotton. Love it! I love the Kingfisher!! The other is also as usual stunning. Could be a great idea this miniature kits. At a quilting supplier in Bethlehem, I always buy some very high quality calico. If it is suitable for the purpose, I don’t know. Too new in this great hobby. A very nice stitching dag for all of you!! Hi Trish, I love the new parrot and have him on my wish list from CB. I’d just like to say a resounding YES to the miniatures; I find large projects slightly overwhelming and am much happier with things I can complete in a 6″ hoop. Also, I think your cotton satin will work just fine, I found it lovely to work with when I did your Blue Wren class at BATB. Dear Trish, stunning work. Beautiful birds, the colors are gorgeous. Concerning the fabrics: At this moment I’m working on your cotton satin. Nice to work on. I have used calico in the past. À very good quality which I ordered in England. The results are good. And working on it is not difficult als friends are assuming. Your last kits for Country Bumpkin are superb. About the miniature, I think it could be a great idea. I’m thinking of those like me who like doing crazy quilting, and small design are just perfect for this technique. About the fabric, I would probably go for the calico. But I notice that the only way to make a choice is to make what one has in mind. Very often, what says the mind doesn’t out so nicely when it comes to the reality. Hi Trish, I like your idea for miniature kits very much, I do petit point on silk gauze for my dollhouse and would really like to try your techniques on a small scale. Fabric is something I have thought about a lot, I tried a bit of crewel work on regular cotton fabric but wasn’t too happy with it. One fabric that I would like to try is cotton lawn, I bought two lawn cot sheets on a sale a few years ago for just R40 each with the intention of cutting it up for doll’s underwear and I have been thinking it might just work well for miniature embroidery. Funny thing is, I was looking at the fabrics on your website just yesterday as I am searching for a 60 count even-weave to do cross stitch on for miniature samplers. Just love the new designs and pansies are a huge favourite of mine – miniature would be good and could be used on so many different things as I think we all get to the stage that we cannot have any more things on the walls and have to look for other ways of using our masterpieces. Also thought the birds were a triumph especially the kingfisher who is a particularly handsome fellow! As for the material I think any material is good as long as it has a close weave and is of a really good quality as you are putting a lot of work into it and it hardly makes sense if you use poor quality fabric. The calico would I think give a nice background nap being slightly textured but to find the required thickness and density of threadcount could be a problem? Have a great week and I hope your weather is better than here – nothing but rain and high winds – just awful! Hi Trish. Stunning work, and YES to miniatures! I love everything in miniature form, but more importantly, at my age, is space for these works of art and costs. One can display a lot more this way and save on thread and fabric and still produce and enjoy your amazing works of art!